Toronto Raptors take University of Washington guard Terrence Ross with No. 8 overall selection in NBA draft. 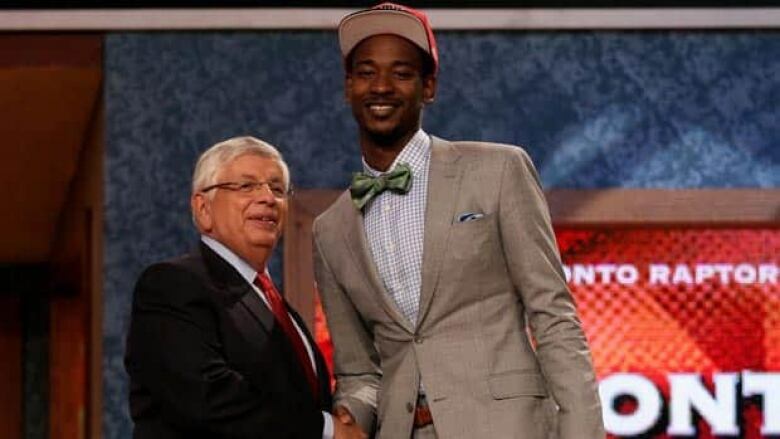 Not many people had the University of Washington's Terrence Ross headed to Toronto with the eighth overall pick in the NBA draft. But given the other options still available, Raptors head coach Dwane Casey was comfortable with selecting the 21-year-old guard. "You can never get too many shooters," Casey said. "We found that out this year. "Shot makers. That's more important than anything else." While some had Duke guard Austin Rivers rated ahead of Ross, Casey says Ross is a more accomplished shooter than the son of Boston Celtics coach Doc Rivers. Ross averaged 16.4 points per game in his sophomore season with the Huskies. "[Rivers is] a point guard," Casey said. "He's got to have the ball in his hands, where we felt like we need a shooter." "I felt Rivers is going to be an excellent NBA player but for us, we needed shooters. [Ross] is more of an accomplished shooter than him right now." Casey was impressed by Ross' play at both ends of the floor when he worked out with for Toronto earlier this month. He's also viewed as a player who can complement DeMar DeRozan on offence. "I consider [DeRozan] a scorer," Casey said. "He's one of our primary scorers so it doesn't affect him at all. "[Ross] is a wing runner, gets his shot up in transition, maybe a quick pin-down. A different type of scorer." Casey doesn't envision Ross coming into Toronto and becoming a regular starter right away, but he does see him locking down a role off the bench. "He can make a shot, so I can feel very comfortable in that but like most kids he's got a lot to learn about the NBA game," Casey said. "He has one skill that transfers and carries over in all levels of basketball and that's shooting." With their two other picks, the Raptors went with size, adding Quincy Acy out of Baylor University and Croatian power forward Tomislav Zubcic. Acy stands 6-7, while Zubcic is seven-feet tall. The Raptors intend to keep Zubcic in Europe to develop, but Toronto general manager Bryan Colangelo likes the sort of energy that Acy brings. "He's really worked on his offensive game throughout the years at Baylor," said Colangelo. "He's just one of the guys that comes on the floor and impacts the game with his energy and toughness." Jonas Valanciunas, Toronto's top pick last June, is expected to make his NBA debut in the fall. Casey feels the Raptors are getting the right parts towards getting back to the playoffs for the first time since the 2007-08 season. "If [Valanciunas] was drafted this year he would probably be two or three. I was with him down there last week with the Lithuanian national team," Casey said. "We have a legitimate big guy in Jonas. "He was very impressive so he along with Terrence and the other kids are going to be good pieces for us." Colangelo said there were some trade options on the table but in the end, they opted to keep the No. 8 pick. Unable to add veteran presence via trades in the draft means Toronto could be busy when free agency opens on July 1. Canadian free agent point guard Steve Nash has been rumoured as one big name the Raptors are reportedly pursuing. "Within the next 24 to 48 hours, we're going to be exploring some conversations that we've been having as the dust settles on the draft," Colangelo said. "Team needs become very apparent, but we are still armed with that [salary] cap flexibility that we have."